As I drove down the road tonight with the windows down, what we used to call “going convertible” when I was a child, I was thinking about all the people I treat at the clinic who suffer with Environmental Illness and Multiple Chemical Sensitivity. Driving with the windows down, the breeze brought the scent of all the different plants, molds, car exhaust, the ever present scents of fabric softeners spewing from clothes dryers, and so much more. I breathed deeply, enjoying the first balmy night of summer and thought how very amazing the human body is and how beautifully God made it. When functioning perfectly, the human body handles pretty much anything it comes into contact with and we are none the wiser that we just breathed in a toxic chemical, mold spores, dirt, and pollen. We drive past yards festooned with exotic flowers and ornamental plants, each with their own unique chemical scents, it was apparent that the beautiful yards had recently been sprayed with chemicals by the lawn companies in the the pursuit of the perfectly green, weed-free lawn, and we don’t realize the complex biochemical adaption mechanisms at work in the body that are necessary to keep each one of those chemicals from causing problems. Every natural or synthetic scent we smell is a chemical floating in the air that we breathe into our body, where it affects specific tissues, when the body cannot detoxify and breakdown the chemical. I think that the wonder of the perfectly functioning body is best recognized in the contrast seen in Multiple Chemical Sensitivity sufferers. If you spend any time around these people you will see that virtually every single miniscule exposure to a chemical, mold spore, or the entire world of scents causes severe neurological and autonomic crisis in virtually every part of the body. Every bite of food becomes a battle of the body, mind, and spirit as the MCS person struggles to fight back the fear of the likely possibility that their body may reject the meager bland food that was good yesterday but may not be handled well by their body today. We talk about restoring Optimum Health a lot here at the Hansa Center. Optimum Health is that point where the body, mind, and spirit can ADAPT instantly and correctly to any changes in its internal and external environment. This is not to be confused with people who have no symptoms. The absence of symptoms does NOT indicate that a person is healthy, as is evident in people who received yearly physicals and enjoyed great health, but “suddenly” found that they have cancer or some other illness that is known to take 10-15 years to cause symptoms. We take so much for granted and trust that we can abuse our body through poor lifestyle choices and get away with it! People often get frustrated when their doctor cannot undo the crisis their body is battling in MCS, but the best any doctor can do is facilitate the restoration of Optimum Health as gently, rapidly, completely, and as inexpensively as possible. A daunting task when the patient’s body is so reactive to virtually everything, including medicines and supplements. As a result of over 20 years of helping people with MCS we have developed several ways to help even when people typically even react to their remedies and supplements. So the next time you are enjoying the scents of summer while driving along with the windows down, “smelling the roses” thank God for your blessing of health. Please be sensitive and courteous to the unseen needs of others and go natural, scent-free. If your scents linger in a room after you have already left, you leave it behind to affect and possibly injure someone, whether you intended it to or not. Choose to go scent free for your own health too! The Hansa Center is a protected safe zone. The entire clinic is EMF shielded and hardwired computers. No artificial scents are allowed. No negative energy and conversations are allowed outside the treatment rooms, and only then only to enable you to communicate what is going on with your body. My husband was recently diagnosed with Stage3b lung cancer. He had not smoked for 30 years. He only found out by getting a smokers screening CT scan. No symptoms. If not for this scan 2 years ago, he would not be here and cancer free (on his scans)today. The days of top down or windows open driving are a distant memory for those people triggered by toxic chemicals in laundry products. Its a sad day when one can't even walk the neighborhood because of the heavy chemically scented detergents and fabric softeners filling the air. 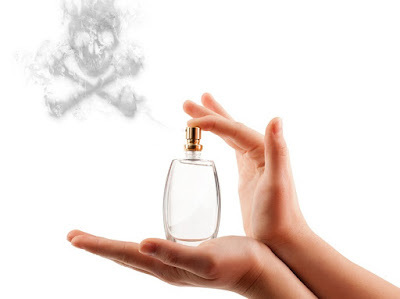 Migraine patients, asthma patients and COPD patients are having a hard time enjoying social gatherings these days, or even sitting on their decks, because these toxic chemicals are allowed in products under the guise of fragrance. Sad state. Corporate greed! Secondhand smoke had nothing on second hand fragrance. At least you could see that coming and take cover!